First Preheat oven at 350 degrees. Then, spread salsa evenly over tortilla shell. I love the salsa base and you can make it spicier with a hot salsa instead of the medium I used. Add onion, red and green peppers. Feel free to add any other vegetables you desire. I like to add olives sometimes but need to add those to my grocery list! Next, add the shredded chicken. This was leftover chicken breast from supper from the night before. I have made this recipe with ground turkey and extra lean ground beef, all are super tasty! Sprinkle on the beloved cheese! Bake at 350 degrees for 15 mins or until the tortilla has turned a golden brown. I like the pizza on its own but my husband loves to dip it in sour cream. Enjoy!!!! Its one of my favs! Its not a huge difference, but a difference! I have less of a muffin top!!! I feel a lot better and it's nice to be able to visualize my progress! The scale tells me I'm losing weight, my clothes are feeling loser, but seeing it like this makes me feel that much more accomplished. 2 Join the local women's soccer league. I played in high school and miss it! 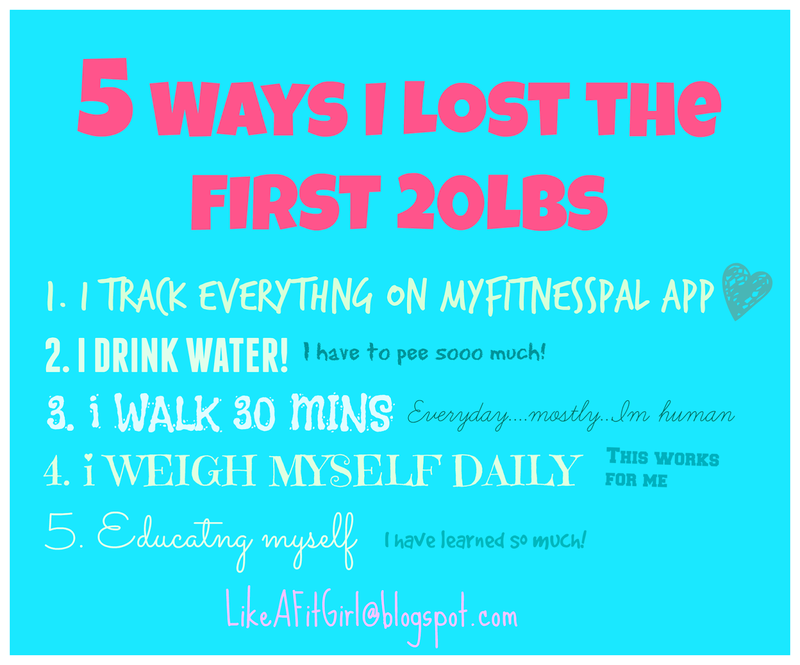 These may change of course as I progress or I accomplish goals. 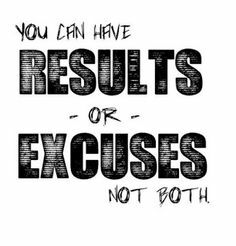 Do you have any weight loss or fitness goals?? So this took me a while! But here it is for all to see. I have been so nervous about posting this because I fear the judgement. However, I need to own it. I own all the bad choices! I own every potato chip and lazy coach potato day that got me here! I have since lost 20lbs and am feeling fabulous! I still have a long road ahead but the results are motivating me! Some of my clothes are already feeling looser and the energy from the exercise has me inspired to do things I would not normally do. My house is a totally a lot more organized and I'm inspired to do more things with my kids too! Can't wait for the next 20lbs to be gone. Maybe Ill start setting some fitness goals....hmmm Ill have to think about that! Progress picture tomorrow! Katy Perry Birthday Party for my BIG little 7yr old! Well my BIG little girl turned 7! When I asked her what theme she wanted for her birthday I was a little shocked! You cant buy Katy Perry birthday supplies at Dollarama! So I had to be creative...I hit up Pinterest of course! I decided on a candyland my daughter LOVED it! Mom of the year right here! I went to etsy (click to see) and printed a candyland themed "Happy Birthday" banner on card stock. You can purcahse a printable file that is sent to you via email. It was fast and convenient. I hole punched each letter in both corners and then weaved pink satin ribbon through and Voila! 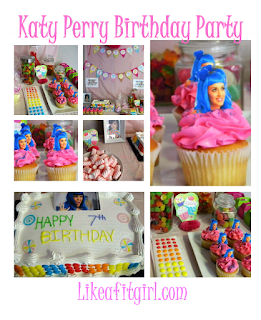 The cupcakes are just vanilla with a pink butter cream frosting and a touch of blue sprinkles to match Katy's hair of course! For the cupcake toppers, I printed off pictures of Katy Perry on some glossy photo paper I had lying around, cut out the heads, and taped them to a toothpick! The cake turned out great...but I have to confess I didn't make it. I ordered a plan white slab cake from the local grocery store and then my daughter and I decorated it. Putting on all the candy dots was the hardest part. I filled up some glass canisters with a variety of candy, printed off some lyrics from her favourite Katy song, bagged some cotton candy, and we had a Katy Perry Party! Finally, we played some fun party games. I had a bunch of leftover rolls of streamers in a variety of different colours. I got the girls in pairs and they had to use the streamers to make the coolest party dress! We had Katy Perry karaoke, musical chairs, and freeze dance! We had a blast and most importantly DD loved it! I should note that all I ate was 1 sliver of cake! Before, I would of ate 2 pieces and munched down all those jujubes! Check it out! Dusted this bad girl off! I didn't get to 30 mins...but managed 20 mins ( Ill take it!). I'm thinking I will do a weekly weigh in..."Weigh In Wednesday"
Isn"t that what we all strive to be? 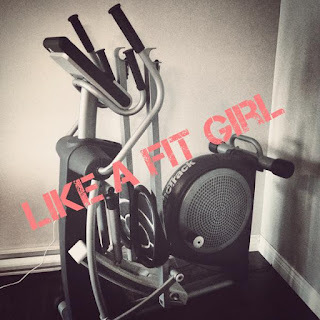 I have decided if I think like a fit girl, I will be the fit girl! For, years I have said its just too hard, too much weight to lose, I'm not built to be skinny...Blah Blah Blah! Those are excuses!! People have lost over 100lbs! So, I can too! 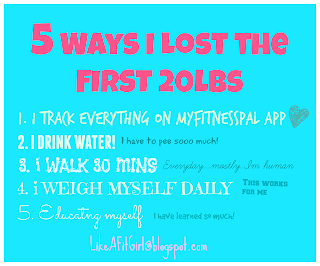 I began eating healthy and tracking my calories with the MyfitnessPal App (Love this!) and using the elliptical I bought a year ago and had never stepped on until this week. My first weigh in I lost 10lbs!!! I want this blog to be a place to share my journey and meet new people with similar struggles. If you happen to find yourself here please comment, share your story, and we can help each other! Visit Likeafitgirl's profile on Pinterest.